Happy Tuesday! As runners we can get so caught up in all our runs that we tend to neglect other forms of fitness. Luckily for me I really enjoy lots of cross training activities. Can I let you in on a secret? Sometimes I’d much rather take a spin class or lift weights than go for a run. I think this is because when I first got into fitness, running was the last activity that I picked up. Before that I was all about Zumba, spinning, boxing and strength training. This week’s Tuesday Topic: What is your favorite cross training activity? You can write about this topic, or feel free to post any running related blog post. Remember to Link-up with Kim and Zenaida and the bottom of this post! If you’ve been following my blog for a while this should not be a surprise. I absolutely love spinning. I feel like it’s a workout that anyone can do because you can really customize it to your fitness level based on the resistance knobs. If you have knee issues it’s great because it’s more low impact than running. It’s an amazing cardio workout that will leave you super sweaty as well. Oh, and let’s talk about the music! You can literally spin to any type of music which makes me happy since I’m a huge music lover. As runners, we need strength training. Let me repeat that – as runners, we need strength training. Not only will it make you a stronger runner, but it may also help ward off injuries. Also there’s just something about lifting weights that makes me feel like I badass, especially when I can lift heavier weights than normal. I also like feeling stronger too! This is one activity that I hope to get back into this summer. My gym used to offer a class that I would take on Saturdays and it was great! I found that it really helped me work on my balance, endurance and reflexes. I still have my boxing gloves and my gym still has heavy bags so I am planning on starting back up again soon. Also, this is an old article from Runner’s World (2014), but it does list a lot of great cross training activities if you’re just looking to get started – pick one! Tell me: What is your favorite cross training activity? Topic for next week – What are your favorite recovery tools? We hope you’ll link up with us! I’ve never tried boxing! I think I would like it. I have so many things I like to do besides running that it’s hard to narrow them all down. 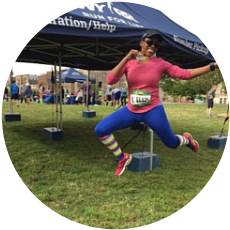 Running gives me the stamina to do all the fun stuff! Boxing is amazing – such a great way to get out aggression! I have many fitness activities I enjoy, too. Most of them aren’t as weather dependent as running! Yoga, Pilates & swimming are my favs. Swimming tends to be weather dependent for me too so I don’t do it nearly as much as i’d Like to. I wish that I was a better swimmer because it’s such a great cross training activity! I guessed spinning would be your #1. I enjoy so many activities sometimes I have to remind myself that I am a runner. Ironically, today I chose running over yoga. Thanks for hosting this link up. Haha me too! Running is not my first love so I always need to remember to balance everything out. Rowing is great too – I know I need to do that more. I love spinning and I’ve always got far more of a high from it than I do from running! However I have limited options at the gym and the music is awful! I would do rock spin or 80s spin in a moment! But I am going to make more room for it in my life again. I always love that post spinning glow, lol. I never tried boxing. I don’t know if it’s something I’d enjoy, but I can definitely see that it would be a good workout! My favorite cross training activities are yoga, strength training, and spinning. I also love playing tennis (which I don’t get to do that often though). Agreed! I feel like there are so many great workouts that I enjoy besides running. It’s hard to choose! You do a lot of cross-training activities, Kim! I love weight training too. I think my favorite cross-training activity is Body Pump, followed by yoga. I just started riding bike again too. My problem is there is just not enough time for all the activities I want to do, plus I don’t recover as fast as I used to! I still need to try Body Pump – I hear it’s amazing! Definitely! Just start off small and do something once a week and then build from there. Spin class is a great workout! I wish I still had classes but they no longer work in my schedule. Barre has definitely made it to the top of the list and I adore yoga as well! They have definitely made me stronger! I have done barre a few times and it’s definitely intense but ii was such a great workout. I haven’t tried boxing but that would definitely be a fun way to cross train. This year I have tried to add spinning back in to my cross training regimen. I think trying boxing would be so much fun! I enjoy yoga, hiking and paddle boarding for my cross training. I wish I got to do more of it!! Boxing is so much fun, especially if you’re having a bad or hard day. Great way to get out aggression! I certainly do know you love spinning but I didn’t know about boxing. That sounds like fun! I used to really be into boxing a few years ago. I haven’t done it recently but I’m hoping to get back on track with it. I am not a fan of traditional spin, but I love the 30 min class I take/teach that is HIIT on the bike! I also love to light weights! HIIT on the bike is such a great workout too!